I got into a discussion with a new trader via email about the concept of buying weakness and selling strength. He said that he was hesitant to buy on down days in the market. When I asked him why he said, "I don't know. It just makes me nervous." 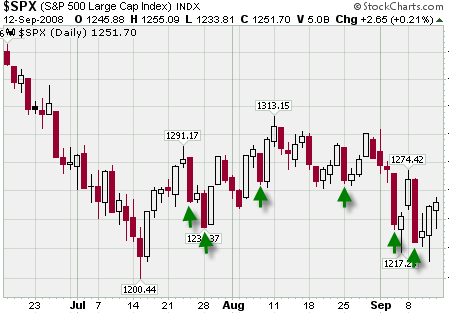 On the chart above, you can see that any major down day (green arrow) in the market is usually followed by an up day! And sometimes, this up day, turns into a 2 to 3 day rally. There will likely not be very many sellers left after a big down day in the market. This can provide us with a good buying opportunity. What should you look for? Look for stocks with relative strength. These stocks will likely be the winners when the market reverses. And the market will reverse. It always does.